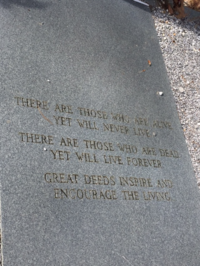 Would you ever fear that your own tombstone would be vandalized out of hate? This is the reality for James Earl Chaney, one of three slain civil rights workers killed on June 21, 1964 by members of the Ku Klux Klan. Chaney’s story has come to epitomize the malice of this era in our history. He is buried on the side of the road in rural Meridian, Mississippi, not far from where he was brutally murdered and buried in a ditch by the Klan, undiscovered for 44 days. 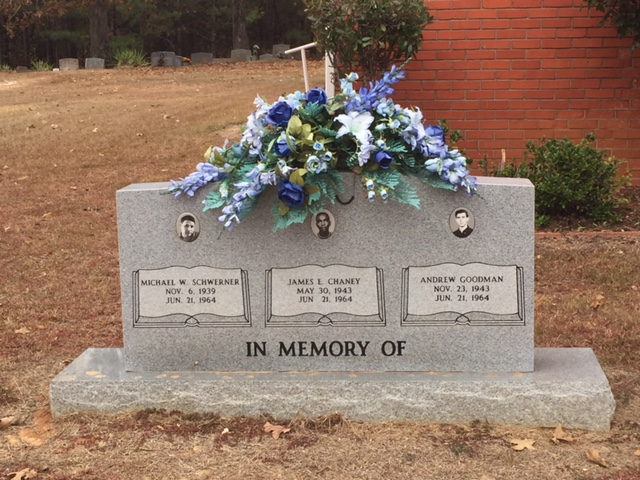 Chaney lies next to his slain brothers, Andrew Goodman and Mickey Schwerner. All burial places should be sacred, but not James’. Over the years his tombstone has been knocked over or defaced half a dozen times, leading his family to attach steel bars to the back of the stone to keep it in place. And the image of his face on the stone has been marred or even shot at as seen by bullet holes on the tombstone. We could not witness clearer evidence that hate and racism persist in our society fifty years after the civil rights movement. 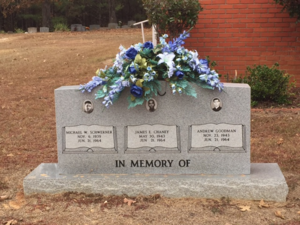 James Chaney’s tombstone represents this fragility of justice, and how we must call upon the strength in our hearts to stand up for ourselves and others every day. 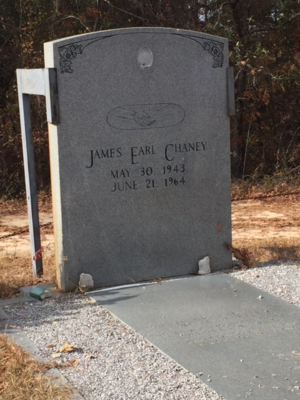 This visit to James Chaney’s tombstone was part of a 3-day civil rights bus tour for education leaders, organized by the John C. Stennis Institute of Government at Mississippi State University and the Education Policy Center at The University of Alabama. Those who attended the tour participate in theEducation Policy Fellowship Programrun by theInstitute for Educational Leadership. 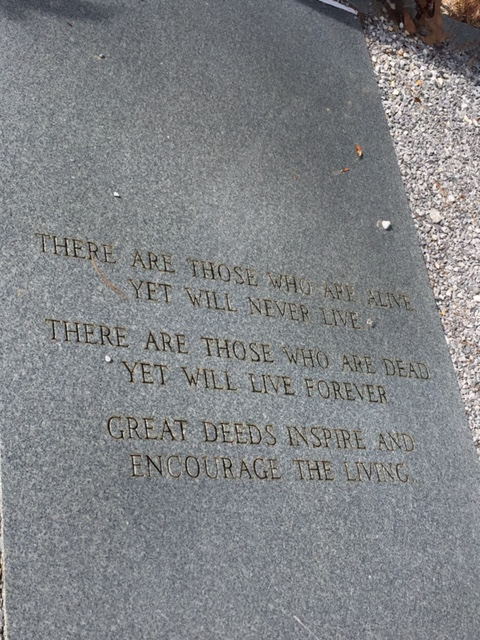 Every aspect of our three-day bus tour was equally sobering yet inspiring; painful but hopeful. Here are a few key themes that emerged for me as we made our way from Jackson to Birmingham, feeling each theme more acutely with each stop. We were often left speechless by the forgiveness and grace people displayed who were affected by heinous acts of racism. Jewel, whose brother and mother were brutally beaten by Klansmen upon leaving a church meeting in Philadelphia, Mississippi when members of the Klan were looking for civil rights activist Mickey Schwerner is one such person. She said, “You have to forgive, or else you can’t move on...but I still get teary-eyed about it.” This amazing level of forgiveness was even more powerful when juxtaposed with the utter lack of remorse or responsibility displayed by the men convicted decades later for the murders of African-Americans during this time. This characterization of the convicted men was illuminated by the first-person accounts of Doug Jones and Jerry Mitchell, an attorney and journalist, respectively, who came to know these men through their work in bringing them to justice. We cannot learn from our past unless we acknowledge and remember what happened. I was struck by how many of my peers on the tour, who were largely community college administrators in Mississippi and Alabama, said they didn’t even learn about civil rights history in school. One of my peers from East Mississippi Community College said “I didn’t learn about civil rights growing up-it wasn’t in our history textbooks. It was all hearsay. 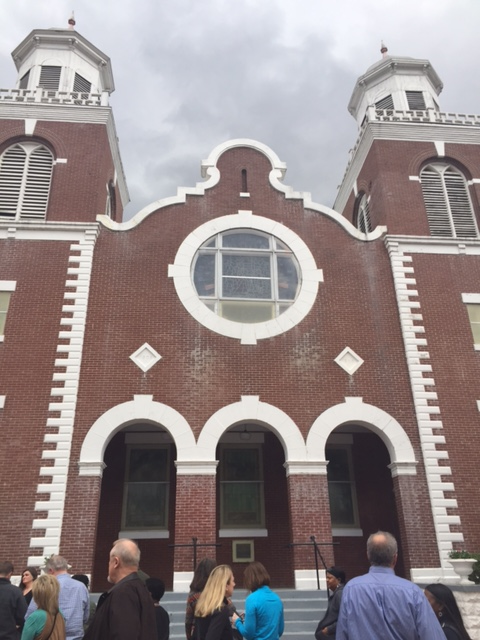 We’d see it in magazines like Ebony.” At our stop in Selma, we noticed a housing project and school right across from the church where thousands of people gathered in 1965 to start the march across the Edmund Pettus Bridge to Montgomery. When one of my peers stopped to ask a young girl if she had learned about this history in school, she had not. We must do better. Our civil rights history is too important, too raw, and too tenuous to be ignored. We were amazed by the courage that so many people involved in the civil rights movement displayed on a daily basis. We felt their courage in the story of Fred Shuttlesworth, a preacher and father who was brutally beaten simply for trying to integrate his children into his local school, three years after the Supreme Court ruled in Brown vs. Board of Education that “separate but unequal” was unconstitutional. 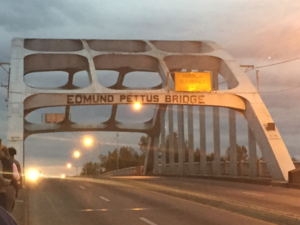 We felt their courage when we walked across the Edmund Pettus Bridge in peace, but recalled the pictures of brutality from the Bloody Sunday march when the Alabama police unleashed their fists, bats, dogs and fire hoses on a peaceful gathering. 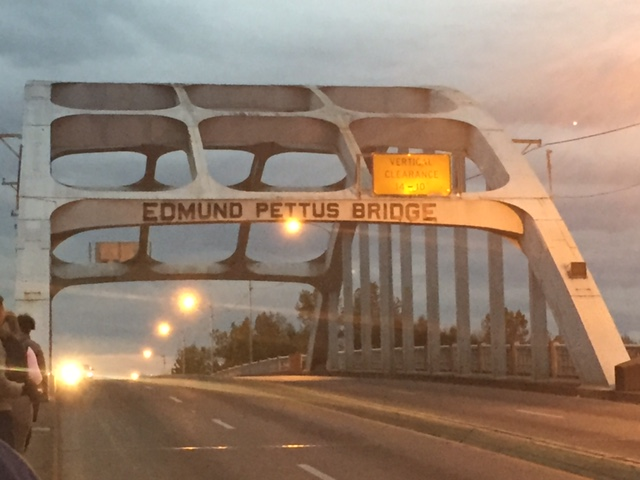 What courage these leaders had to return to that bridge twice more, determined to make the journey to Montgomery. We felt their courage in picturing a 25-year old Martin Luther King, Jr. organize the year-plus long Montgomery bus boycott in 1955 in the basement of the Dexter Avenue Baptist Church, just steps from where Governor Wallace had only recently vowed for “segregation now, tomorrow, and forever.” We learned that gathering in church the night before a march or protest and singing songs like “Aint Scared of Nobody” gave so many people the courage to do what they did the next day. When Martin Luther King, Jr. made the call for people to join him in the march from Selma to Montgomery, all kinds of allies showed up: black, white, Jewish, Christian, Muslim, young and old. People were called to a movement that was fundamentally about human rights, and the belief that we all deserve the same rights and liberties. 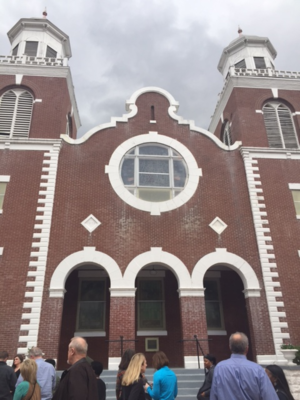 In a similar way, and without anticipating it, we realized on the last day of our bus tour that we as a group had unified around this common powerful experience, and pledged to support one another in our own work to advance civil and human rights. So, where does this leave us today? How do we protect and uphold this fragile justice -whether it’s rights for African-Americans, Latino, LGBTQ, Muslims, immigrants, or any other targeted group? We must first recognize that we are the ordinary heroes that we’ve been waiting for: the people who will counter every hateful act with one of love, and put tombstones like James Chaney’s upright again and again when they are knocked over. We are not unlike the ordinary heroes of the civil rights movement: so many men, women, and young people whose names we’ll never know who carried the movement forward through their small acts for justice.